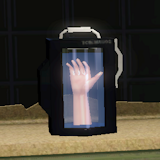 Poor Jack wanted to find the Doctor so badly he developed a bio container technology that once held the Doctor's hand it proved useful when the doctor needed a bio-matching receptacle. Allows a Timelord Sim to divert regeneration energy, to avoid changing upon regeneration, though there are consequences to suppressing to much energy. Change: Regen divert energy (Artron), only if match sample. Change: Clone based physically on original sample. Added: React if Sample Provider on Lot.